Through Sedona Realty, you may establish a working relationship with me, Claudine Pinto, Associate Broker, Russ Lyon Sotheby’s International Realty. I can work with you over a distance, as well as in Sedona, while you become familiar with the inventory and the buying process, narrow your choices, and complete your property purchase. I also work with a pool of other agents, whose knowledge and expertise can be tapped and shared during your purchase process. Please feel free to use this site! 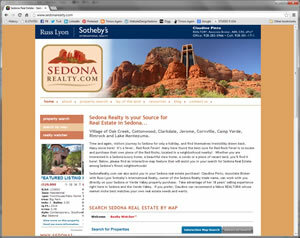 Before Sedona Realty became only a website presence, it was Sedona’s oldest continuously-operating real estate company for over 45 years. I bought the company in 2007, and continued the bricks and mortar business model until closing the company in late 2011. My real estate career started in 1995. In 1998, I achieved an Associate Broker license. In 2006, I became the Designated Broker of RE/MAX Sedona. During the years I owned and ran Sedona Realty as a real estate company, I was its Designated Broker as well as its top producer. It is this vast base of experience that I bring to the table and offer to my clients for their risk management protection. I was born and educated in the Midwest. I have been lucky to be a full-time Sedona resident since 1980. My dear husband is Ralph Pinto, a general contractor (P2 Construction). We have one lovely, adult daughter, Brianna.